I am available to assist those applying to graduate school and other educational programs, including summer programs, private schools and boarding schools. I offer full-service editing and coaching for individuals writing fiction and nonfiction, and for organizations and companies. 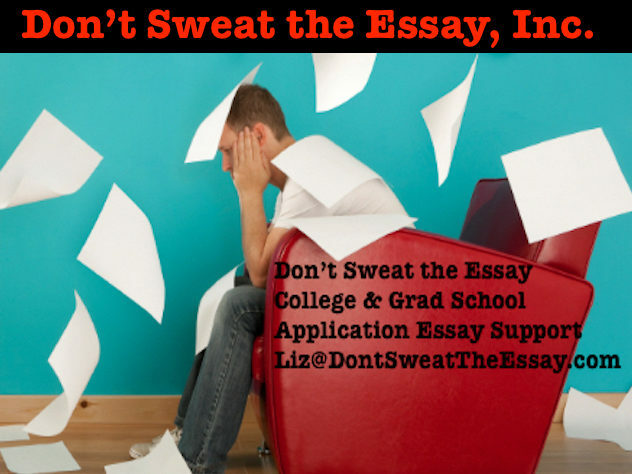 For details, please visit: ElizabethBenedict.com or email me at Liz@DontSweatTheEssay.com. ++ In this crazily competitive college application world, standardized tests matter in many – though not all – applications. A growing number of colleges are “test optional,” and the list changes from year to year, so please check carefully. For the current list of “test optional” institutions, go to FAIRTEST. If you are applying for financial aid, “test optional” may not be an option, but check with specific colleges. ++ I am happy to refer clients who need SAT, ACT, and other standardized tests, including TOEFL, to ArborBridge. They work on-line with students around the world in innovative ways and offer many different packages depending on your child’s specific needs. They also offer a free diagnostic test. ++ If you or your child prefers an IRL experience – a tutor showing up at the door – please consult NoodlePros, which also works online as well as in cities around the country and in Canada, France, and New Zealand, offering a range of tutors at different prices levels.